Whether it’s the Bad Boys or the 2004 underdog squad, most of the Pistons‘ success has been a team effort. There was, however, one player in the 1960s who carried the team, but was overshadowed by Wilt and Bill Russell’s epic battles. That player was point guard Dave Bing. Bing was one of the league’s top point guards outside of Oscar Robertson, and he would average 27 points, six assists and five rebounds per game in only his second NBA season. Bing was basically the team that season, as he attempted an unheard of 24 shots per game, converting on nearly 11 of them. 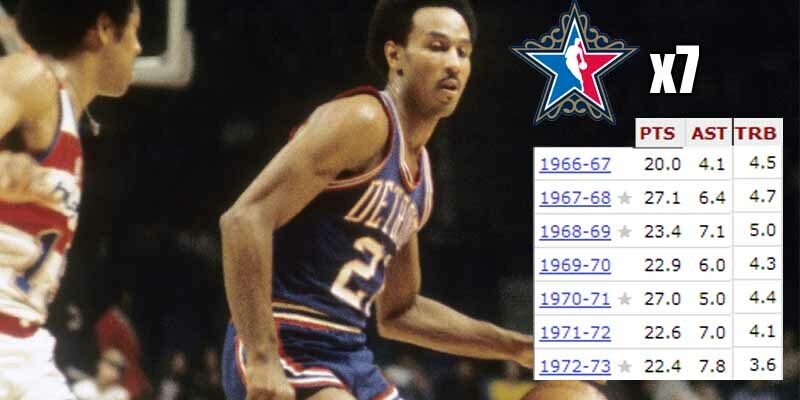 Bing made it to seven All-Star teams, win the 1977 All-Star Game MVP, make two All-NBA First Teams and one All-NBA Second Team and finish as high as third in MVP voting. Despite that, he only made three post-seasons, never advancing past the first round.